Outdoor ants are known for building unsightly mounds in gardens and causing structural damage by hollowing out wood for their nest. If you happen to find a couple of ants in your garden, very likely you are dealing with an ant infestation since ants live in colonies. An ant infestation is hard to control and in order to control the colonies you must eliminate queens and other colony members found within the nest. Finding the actual nesting site is therefore key to controlling outdoor ant colonies. Try to locate the ant's nest. 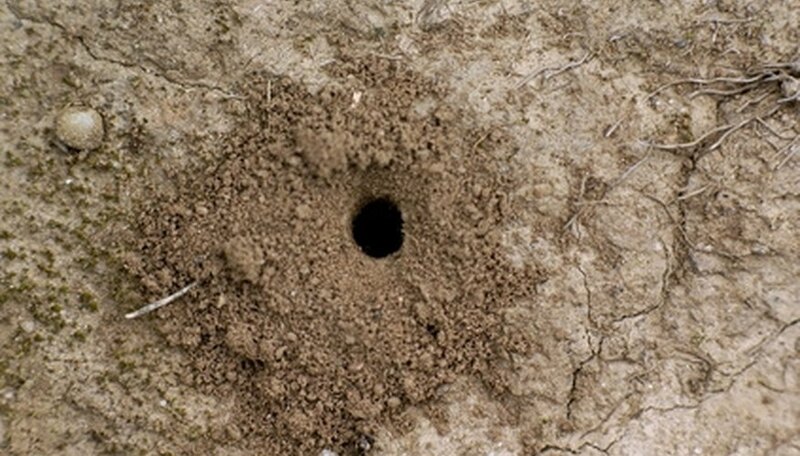 A mound or an anthill are the most obvious signs of a nesting site. Nests may also be found concealed under mulch, gravel, stones, landscaping timbers, pavement or under the grassy areas next to the foundation wall of the home. Exterior siding or wood trims damaged by moisture are other preferred nesting sites. Place some dabs of honey on an index card to reveal the nesting site if not found or confirm the nesting site you suspect. The ants will feed on the honey and head back to the nest. Follow the ants to track down the nesting site. Place the ant bait besides the outdoor nesting site. If you were still unable to locate the nesting site, place the ant bait near the trails of ants. The ants will eat the granules inside the bait voraciously and take some back to the nest to the queen. In order to get rid of outdoor ants, the whole colony must be destroyed. Always read and follow instructions carefully when using pesticides. Consider that ant baits may take several weeks to eradicate the ant problem. Use more than one bait for heavy infestations. Replace the ant baits as recommended. Never spray the ants with insecticide when using ant baits: the foraging ants will die without taking the bait back to the nest. Excessive rain may reduce the effectiveness of baits. Do not put out the baits on extremely hot and rainy days as there is not as much activity. Keep the ant baits away from small children and pets.